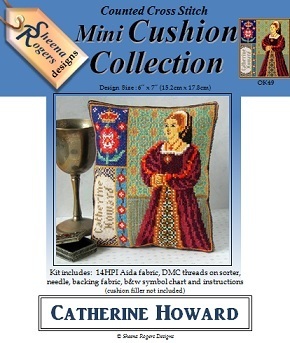 Stitch a slice of Tudor history with this mini cushion design of Catherine Howard, Henry VIII's fifth wife. A young, joyous Catherine Howard became Queen of England in 1540 aged only 16 or 17 but only lived for another 2 years, when she was beheaded on the grounds of treason by committing adultery whilst still married to King Henry, sharing a similar fate to that of Henry's second wife, Anne Boleyn. A tragic tale. This triptych design features a portrait of Catherine, set against a tapestry-style background, with a second panel of Catherine's badge (showing a crowned red and white rose without a thorn, representing grace, beauty, love and faith) plus a third panel with her name and a mini Tudor Rose border. Only whole cross stitch is required with some backstitching needed for the finer details.